OpenVPN will allow your connection to be encrypted when you talk to a network, but the documentation is awful unless you happen to run networks everyday. Here is a howto that will explain how to set up an OpenVPN server that you can login to, access things on that local network, and when you surf the Internet, you will “appear” to come from your OpenVPN server’s location. This cut/paste how to is done with Debian Squeeze/Wheezy, though it could be modified and will work on a number of Linux/BSD distro’s, so choose what works for you. It’s not really exhaustive or ultra-secure, but it has decent security, works well and is very solid and requires little maintenance. For the next step up in security, you might try a IPSEC VPN, they’re better, but this isn’t too shabby, and it’ll run on very low powered hardware that costs very little. #set_var EASYRSA_REQ_ORG        "Copyleft Certificate Co"
#set_var EASYRSA_REQ_OU         "My Organizational Unit"
now you have to configure your client on your laptop. 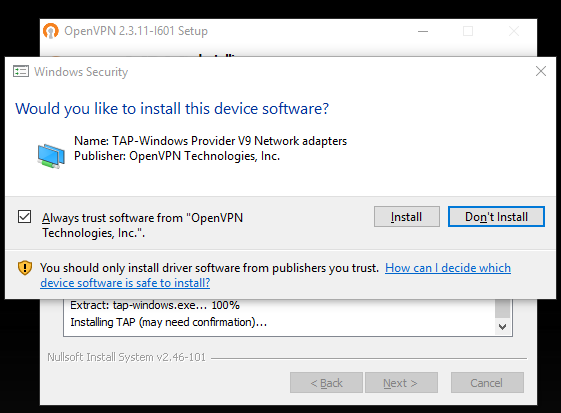 To do this, you have to download the openvpn client from their website (or use tunnelblick for mac). 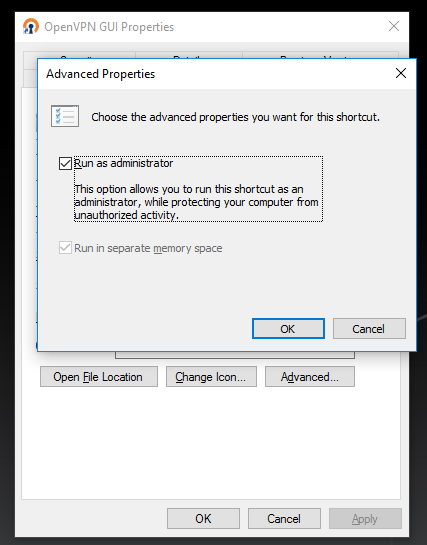 Just copy those files listed above to your laptop, then use them to connect the client using that configuration. You can import client.conf into the client, and *usually* it will work. You have to install this driver or it won’t work. 5. Click on the gui icon. When that starts, it will put a tiny icon in your systray. 6. Right-click on that, then select “connect”. You should see a text window open and show the connection details (many lines scrolling past), but eventually if it’s successful, that window will close itself, and then you’ll see a tiny pop-up window saying that you now have an IP like 10.x.x.x, which means you are connected to the VPN. 7. Now if you visit www.whatismyip.com, you should see the public IP of your VPN, not the local connection you are using. This means you now “appear” to be coming from that IP, and are routing all your web/email/IM traffic through your VPN over an encrypted tunnel. Windows 8 works the same as Windows 7, but you MIGHT have to do an extra step. Before you do that, try to download and install the latest version 64bit here or 32bit here. If it doesn’t work, try these next steps. 3. On the Properties box under the “General” tab (which should just come up), change the “Startup Type:” to automatic, is probably was manual before. 4. Further down the dialog box it should say “Service Status:” which is probably “Stopped”. Hit the “Start” button, which will enable the stuff you need to continue connecting to your OpenVPN server. 5. Hit “Apply” and then “OK”, then close out of your “Services” dialog box. 6. Now continue with Step 5 on the Windows 7 client section above this one. 1. It should be the same as Windows7/Windows8. 1. Download a client, I used tunnelblick, but there are others. Here we will walk through the setup for Tunnelblick. 5. Open up a browser and navigate to whatismyip, you should see the IP of your VPN server, this means it working, and your connection is now encrypted, so you will now “appear” to be coming from your VPN’s IP address, not the IP address of your Mac.